This week the WIT blog is following our agent Nancy as she sails around the Caribbean on the Star Clipper! On Monday, Nancy had a chance to view one of the other world-class ships, Royal Clipper, docked at Dominica during her stop there—and we can’t wait for her report. Today, let’s take a look at the first ports on her journey, together with some fun facts of the Royal Clipper! 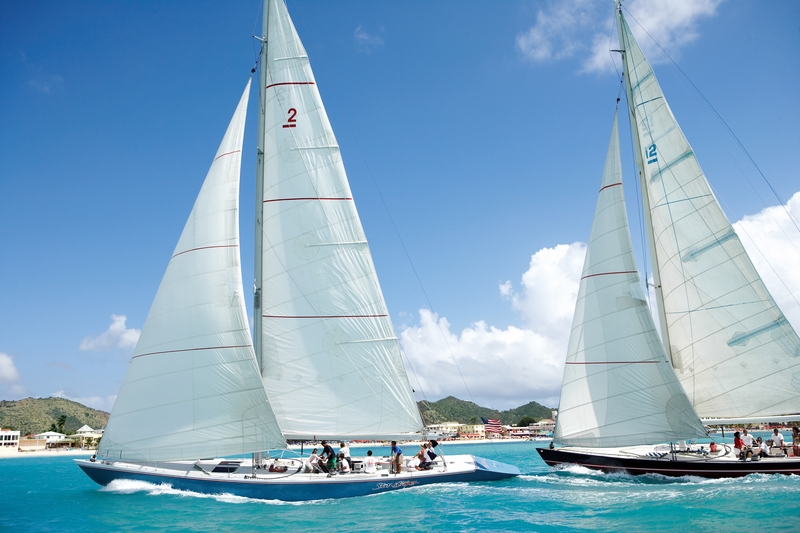 For more information the port of Philipsburg, St. Maarten, check out our blog post on it! The port of Nevis is known for its lush verdant forests and its peaceful atmosphere. The island tends to be quieter and less touristy than her sister St. Kitts. The main city of Charlestown has charming Victorian-style cottages and the famous Eva Wilkin Art Gallery. For some adventure, head out of town to Nevis’s Peak or to the cloud forest to glimpse some vervet monkeys and tropical flowers. Dominica is an island famed for its mountains, volcanic peaks, natural parks, and spectacular flora and fauna. If you want to go exploring, hike up some of the 115-mile Waitukubuli National Trail that runs through lush rainforest. Snorkelers should head to Champagne, where the underwater volcanic vents spew out continuous streams of bubbles. It’s on Dominica that Nancy will get a chance to board the Royal Clipper—the largest clipper in the three-ship fleet! Royal Clipper is the first fully rigged square-rigger with five masts constructed in over one hundred years. She was modeled after the Preussen (1902) & she approximates Preussen in all major measurements. Forty-two sails are used to propel the ship. The sails are made of Dacron & tailored especially for the ship by Doyle Ploch Sailmakers of Clearwater, Fla.
All sail stitching is especially resistant to weakening caused by tropical sunshine, and a computer designed all but one sail. So much Dacron was needed (the biggest sail order ever placed for a single ship) that the supply in the United States was exhausted and some Dacron had to be imported from Europe. A sail maker is a permanent part of the ship’s crew, with a special sewing machine always is available. The Royal Clipper does not use computers for sail handling. All sails are raised, lowered and positioned from the security of the deck by skilled sailors who use power winches and hand-controlled horizontal and vertical power furling. Just a quick update from the Star Clipper. Easy boarding in St.Maarten. She sails typically from 6pm to late the next morning. There is a lot of movement when we are under sail. You KNOW you are on a sailing ship. Rob [Nancy’s husband] helped hoist a sail on our first evening out. One must be able to navigates lots of stairs every day to enjoy Star Clipper. Even the gang way has over 15 steps; it angles down the side of the ship. The cruise director does a couple daily talks on various subjects: Christoper Columbus, maritime history, navigation…..each daily schedule delivered to the cabin also has an article: today’s is on the history of seasickness. Did you know that even fish get seasick? Yesterday we met the Royal Clipper. We both raised our sails and then approached Dominica together. Quite exciting! I’m so glad we got to tour her. She is very different from the Star Clipper, and not just in size. She feels more spacious. And she has 14 deluxe suites with verandah, which are very popular. Not to mention a spa with a hamman, treatment rooms, massage, and some fitness equipment! Interested in sailing with Star Clipper? Willamette Intl Travel regularly books these boats and would love to tell you more! Call us at 503.224.0180 or info@wittravel.com. For a firsthand review, ask to speak with Linda. Filed under Caribbean, Cruises, Dominica, Our Travel Agents, St. Kitts and Nevis, St. Maarten/St. Martin, Star Clipper, Travel by Ship, Where in the World is the WIT Agent?